AVADirect’s custom-built Mini Gaming PC packs some serious power inside its small, shock-resistant mini-tower. This compact gaming PC doesn’t come cheap, but the $2000+ price tag isn’t too bad considering some gaming rigs will cost you over $5000. Plus, the performance – it scored an impressive 200 on our WorldBench 7 benchmark tests – is well worth the price. Our review model costs just over $2000 (approx. $2030 as of 10/22/12) as configured. Packed inside the BitFenix Prodigy mini-tower is a third-generation Ivy Bridge Intel Core i7-3770K processor, 8GB of RAM, and an Nvidia GeForce GTX 680 discrete graphics card. The system also features two hard drives: a 2TB traditional HDD spinning at 7200rpm, and a 256GB SSD, which helps the system start up quickly. Other features include 802.11n Wi-Fi and a Blu-ray disc RW optical drive. The Mini Gaming PC runs a 64-bit version of Windows 7 Home Premium. 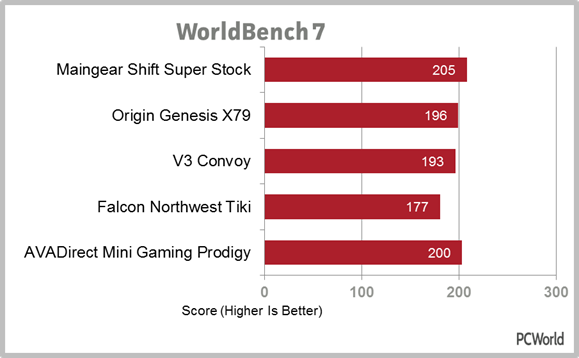 As I mentioned earlier, the Mini Gaming PC performs very well in our WorldBench 7 benchmark tests. The Mini Gaming PC scores 200 out of 100, which means it’s twice as fast as our testing model. Our testing model is a little dated these days, but it’s still a decent machine, with a second-generation Sandy Bridge Intel i5-2500K processor, 8GB of RAM, and an Nvidia GeForce GTX 560Ti discrete graphics card. The Mini Gaming PC just barely beats out its similarly-equipped rival, the V3 Convoy mini gaming PC, which scored 193 on WB7. AVADirect’s model performs well in some of the individual performance tests. Perhaps most notable is its quick start-up time, which, while not critical for a desktop system, is convenient. 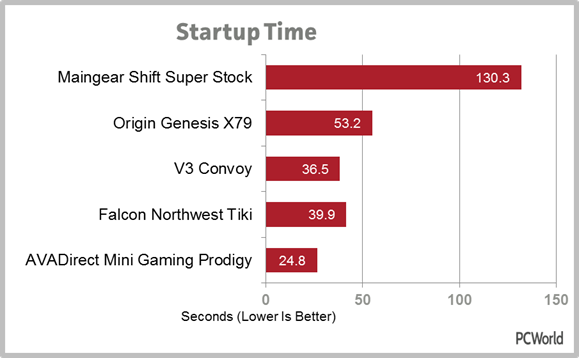 The Mini Gaming PC starts up in just 24.8 seconds, which is 11.7 seconds faster than the V3 Convoy and a whopping 1 minute and 45 seconds faster than the Maingear Shift Super Stock, which is currently our top-rated performance desktop PC. 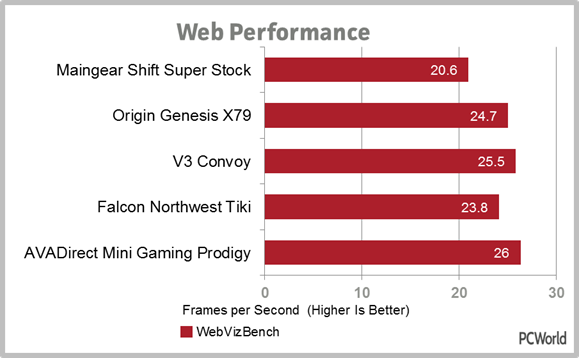 The Mini Gaming PC performs well in our web performance tests, outputting 26 frames per second. This is just slightly faster than the V3 Convoy, which outputs 25.5 frames per second on the same test. Office productivity is another story, however. 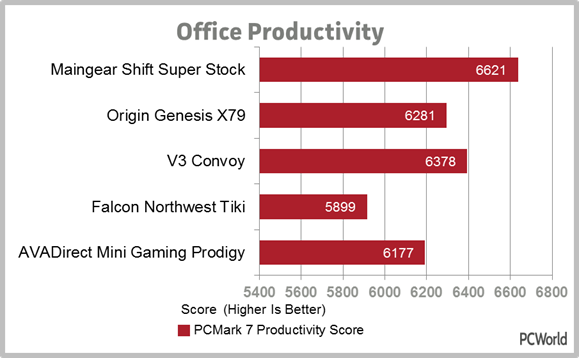 In the PCMark 7 office productivity test, the Mini Gaming PC scores 6177. This is still pretty decent, but it’s almost 500 points lower than the Maingear Shift Super Stock, which scored 6621. The Maingear Shift Super Stock sports an Intel Core i7-3960X processor, 16GB of RAM, and an AMD Radeon HD 7970 discrete graphics card, but also costs more than twice as much. Thanks to its EVGA Nvidia GeForce GTX 680 discrete graphics card, the Mini Gaming PC performs well in our graphics tests. Its performance is up to par with its competitors, except at very high (2560 by 1600 pixel) resolutions. At the 2560 by 1600 pixel resolution, the Mini Gaming PC lags behind the V3 Convoy, which has two Nvidia GeForce GTX 670 graphics cards. 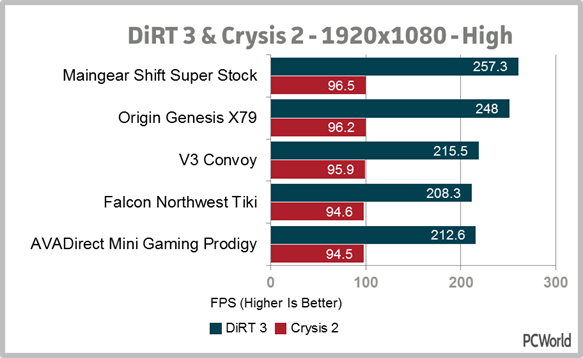 In our Crysis 2 graphics test, the Mini Gaming PC managed frame rates of between 35.9 (maximum quality settings, 2560 by 1600 pixel resolution) and 97.3 (low quality settings, 1024 by 768 pixel resolution) frames per second. 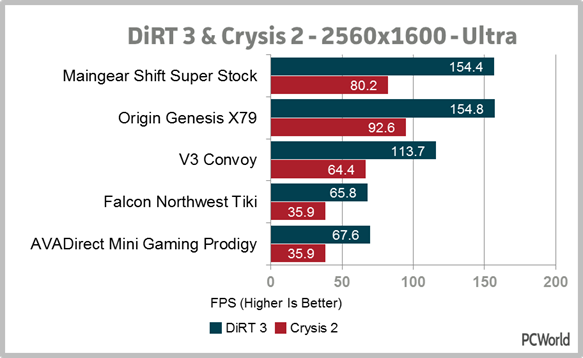 In our Dirt 3 graphics tests, the Mini Gaming PC manages frame rates of between 67.6 (maximum quality) and 231 (low quality) fps at the 2560 by 1600 pixel resolution. By comparison, the V3 Convoy outputs frame rates of between 113.7 (maximum quality) and 269.4 (low quality) fps on the same test. Our review model is housed in a white BitFenix Prodigy Mini-ITX chassis, but you can choose your case from AVADirect’s website when you create your system (your choices are a CoolerMaster mini-cube or LIANLI mini-towers in different colors). The Prodigy case is small and boxy, measuring approximately 9.8 inches wide by 14.1 inches long, and is about 15 inches tall. Four rounded handles, made of BitFenix’s special “FyberFlex Composite” material (sort of a springy plastic material), suspend the Prodigy chassis. These handles are located on the top and bottom of the chassis and seem a little, well, flimsy. The top handles don’t seem like they’d support toting the chassis (full of components) around for very long, while the bottom handles are rounded and cause the chassis to wobble dangerously whenever you touch it. Wobbly handles aside, the chassis is pretty nice. It’s attractive, with white metal sides, a soft rubbery white top with a removable black mesh panel, and a white front plate surrounded by a black border. The right side of the case is plain and blank, save for a power button, reset button, headphone/microphone jacks, and two USB 3.0 ports in the lower left corner. The left side of the case has a rectangle of dotted mesh for ventilation. It’s very easy to get inside the Mini Gaming PC: both sides are removable (and are each attached with two thumbscrews at the back), and there’s a fairly large removable black mesh panel on top. Though the chassis is small, it’s nicely set up and you can squeeze quite a few extras in there. On the left side, there are two easily-accessible 5.25-inch drive bays, both of which are full – one holds the 2TB HDD, while the other holds the (much smaller) 256GB SSD. I’m not sure why AVADirect decided to put the SSD in this huge 5.25-inch bay, when there are three small SSD-sized drive bays attached to the inside of the removable right panel. The Mini Gaming PC is built with an Asus mini-ITX motherboard, which has a great port selection, perfect for plugging in all of your gaming peripherals. The back of the system features four USB 3.0 ports (six total), four USB 2.0 ports, one SPDIF out, a Gigabit Ethernet port, and microphone, line-in, and line-out jacks. The motherboard houses one DVI, one DisplayPort, and one HDMI, while the GPU houses two DVI ports, one DisplayPort, and one HDMI port. The system does lack eSata, support for 7.1 surround sound, and a multi-in-1 card reader. AVADirect has built a nice little gaming system that will appeal to moderately-heavy gamers. The Mini Gaming PC is an excellent performer, though its graphics performance is a little less-than-impressive at higher resolutions. Gamers will appreciate the multiple output options and the six USB 3.0 ports, but the lack of support for surround sound might bother some audiophiles who like to fully immerse themselves in virtual experiences. At just over $2000, the Mini Gaming PC is a good choice for gamers on a budget, and the chassis, though small, leaves a decent amount of room for upgrading. We gave the Mini Gaming PC an overall rating of 4 stars, because it’s powerful, compact, and surprisingly tinker-friendly. AVADirect's compact gaming PC is housed in a surprisingly tinker-friendly chassis.